An article by Mr. Balamurali Krishan – founder of eyam.co.in; a portal to capture best practices in education. A 13 year old boy finds a way to chase lions using flash lights. Necessity is the mother of invention. we could say learning. An amazing model of evaluation within children and guided by a facilitator. Constructive Criticism and Feedback. Used in the right spirit can work wonders. 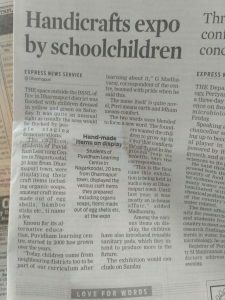 Arvind Gupta had taken science to children and general public. A mesmerising and inspiring human being. A role model for teachers and Guru for learners. Arvind Gupta’s TED Talk. Must watch. An article in Governance Now Magazine on Puvidham. After the brief rains in July we have had no showers till December 13th when the cyclone hit Chennai. Our rain fed crops have failed and we have lost seed of the pulses that we grow every year. Green gram, black gram, pigeon pea, chick pea and cowpea all were sowed but nothing survived the drought. Our well in the hostel has dried up and we have to transport water for all our activities from the old hostel land. This adversity has made us think of ways of recycling our bath and wash water. We now have a system where all the bath water and wash water is used for growing vegetables, herbs and fruits! In the second week of October we had a workshop for children to learn about electronics and dramatics. Bala from Aatrral in Coimbatore came with his colleague Sarath Balaji to help the children to get their head around electronics. 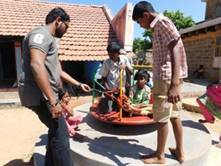 Bala and Sarath load tested the merry go round mill that we had put together with the help of Gautam from SARANG. It was found that the mechanism would be very strenuous to rotate. So we decided to attach a second hand gear box to facilitate easy rotation. Now it is working and we are able to grind rice flour, idly flour and make khambu and solam rava. The children are able to see how gears work and how human energy can be used to make machines work. The children also attached a cycle dynamo to the charkha to see if they could generate electricity while spinning! Though they could generate electricity with a lot of effort they were unable to do so while spinning! All this means a lot of fun and experimenting with ideas that helps the kids to grow into creative individuals. Mr Arvind and his team Clay Fingers from Chennai came to teach the children how to play the tappati and helped them to write songs about nature. 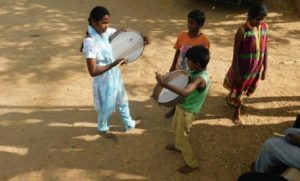 All the kids and teachers wrote songs about different themes connected with our work in the village concerning the revival of the river Nagavathi. The next week we went to Nagarkoodal village singing the song to revive the river and the people all extended their support for such a project. We are now in the process of writing a project proposal to make this dream a reality! 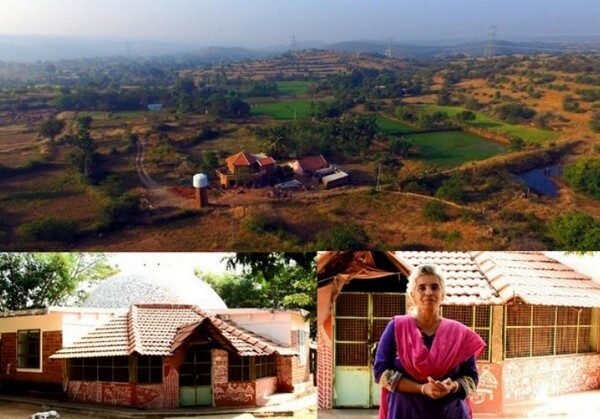 In connection with this, Meenakshi and Geetha; who has joined the puvidham team especially for this work, went to Rajasthan to see Mr. Rajender Singh’s work in the Alwar district. Mr. Rajender singh is lauded as the water man of India because the work he has facilitated in that region has revived 6 rivers and brought life to the deserted landscape. 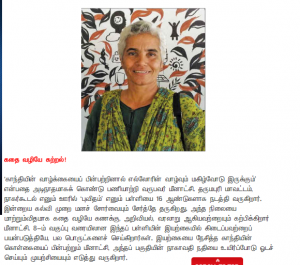 Geetha made a small documentary in tamil to share with the people of Nagarkoodal. There seems to be much hope and apprehension among the people regarding the water harvesting systems proposed. There is also the general feeling that there is no rain so all the water harvesting work would be a waste. More time needs to be spent with the people to ease these fears and build their confidence in the one and only way in which we can save our agriculture and our livelihoods in rural areas. On the 12th and 13th of October 55 teacher trainers from Teach For India came to puvidham to learn about our sustainable, minimum waste lifestyle. They stayed in the old hostel building, used the composting toilets and cooked on the smokeless chulha. Meenakshi did a 40 minute Eurhythmy session with them after which there were question answer sessions where they enquired about our teaching methodology and shared their ideas and appreciation. Towards the end of October we took the 7th and 8th class for a weeklong trip to Coonoor, Gudalur, and Wayanadu. At Coonoor we stayed at Ashok and Malathi’s farm called Sounds of silence and it was indeed a very refreshing experience for all of us. We trekked in the long wood shola in kotagiri. Mr Bhoopathi was our guide but the whole trek was orgainsed by Dr. Rajasekar from Chennai, who is a well-wisher of Puvidham and an ardent bird photographer. After Bhanumathi akka’s workshop the children had been going to the forest in pairs to observe and make any pictures of birds or insects. They have been very successful in making pictures of birds that we did not even know were around puvidham. When Dr. Rajasekhar subsequently visited puvidham they showed him their pictures. He spoke to children on how to make good pictures of birds by creating a bird bath and a hide out. We have made the platform and Dr. Rajasekar is getting a stone bird bath built which we shall set up on the platform. In the meanwhile the tree house that the 7th 8th children had started to build after building the small mud playhouse has been completed and is flush with visitors all day, some children, some squirrels and many birds… we have seen the white bellied drongo, the bee eater, the paradise fly catcher, the oriole and of course the sunbirds and the mynas the woodpeckers and the cuckoo. The kids of all ages go up and down the tree house all day. Some read, some sleep. But it is hardly ever empty! At first it had only a platform. Then we decided to put some kind of a roof. The children of class 7 and 8 wove a bamboo frame and the children of 5th and 6th wove coconut leaves to make a completely weather proof roof! In November, Emily Mignanelli who is a teacher in a democratic school in Italy, a Montessori teacher and teacher’s trainer and works in University as Professor assistant in General Pedagogy came to puvidham and stayed with us for 10 days to understand our challenges and make a documentary so as to contribute to the actual debate about education and give a new glance on what is a good way of educating children and finding possible ways to support it. On 13th November Meenakshi and family went to WARDHA to receive the MAA BABA award for taking Nai talim forward in puvidham. This award was given by Mithu Gosh the only child of Asha Devi and Edward Aryanaayakam who started the first Nai Talim school in Seva gram. We all feel really honoured to receive this prestigious award for our humble task. On November 9th the children of class 5 and 6 left for Marudam farm school to participate in the craft workshop for 10 days. They came back full of new ideas and energy as usual. It was during this time that we suddenly hit upon the idea of using entrepreneurship as a strong core of the learning process for children above the age of 10. We have always been uncomfortable with the textbook reading that we have to revert to because there is no choice for these children but to go back into the system to finish their 10th and 12th. Gandhiji in his Nai Talim has expressed clearly that children must learn through some craft. This year we finally decided it was time for us to take our school forward and try to provide a richer learning experience with entrepreneurship as a core of their learning process. We spoke to the children about it and they were very excited about the whole idea. As a start we decided up on green businesses like soap making, calendar making, making reusable cloth sanitary pads, cloth bags, paper bags, nursery of herbs and medicinal plants, herbal tea, tooth powder, bathing powder, products from coconut shell like soap boxes, earrings, phone stands, spoons and ladles, puzzles and other learning material. We allowed the children to choose the entrepreneurship of their choice and gave them 3 hours each day to make their products. At the end of two weeks we had enough products to make a tentative sale to see if our children would be further inspired to learn through entrepreneurship. 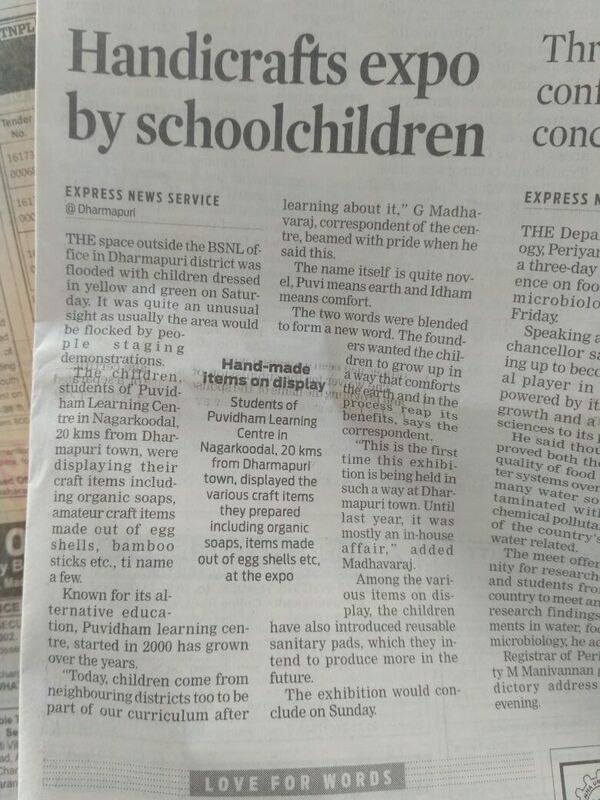 We put up a stall in Dharmapuri on a week end and ended up selling out almost all of the products we had made. It was a phenomenal experience meeting so many people and explaining to them the uses of their products trying to convince them to buy them for the sake of the environment and to boost local economy. It has enthused the children with such energy that even the children totally averse to reading and uninterested in math have decided to learn these totally uninteresting subjects because they see the application of these in their enterprise! We are now thinking of creating a curriculum around these enterprises where all the concepts that are deemed necessary to be learnt are woven together around the enterprise. We really like this “Avatar” of our school where the children are busy making something and looking for information on how to make them better! Kunal Kapoor, who is working closely with Prabhakar Pandey, a faculty at the Centre for Alternative Education at Sanchi University of Buddhist Indic Studies spent one month observing how children learn at puvidham. Prabhakar Pandey the head of the department also came and stayed for 3 days and had long discussions on the philosophy and culture and the learning of puvidham. The school building freshly painted after cementing the roof! We have to renew our school approval every three years and it was due for renewal. So we had applied for the renewal and had also comply with the new RTE. This required modifications to one of our buildings. Our building had a roof where some of the rooms were tiles over a mild steel under-structure. So we had to redo the roof with ferro cement and then cover it with the same tiles to reduce the heat and also for aesthetic value. We have resubmitted our application for renewal and awaiting approval. Though the task of redoing the roof cost us money and resources, the building has got a fresh look and it is worth the effort for “those little moments” with “these beautiful individuals”. These tiny tots leave home to come to school around 8.00 before their parents go out to work and reach home around 5.30 when their parents are back home from work! And all the day in the school they are cheerful and have a great time! Just looking at them play cheers us adults up! They are inventing games and creating rules every day. They have a perfect understanding of the quality of the different materials around them and use them effectively to experience bounce, or extend their reach! The wonderful patterns in nature created randomly by fallen leaves and moss growing on the rock leave us to think how we ended up creating ugly townships and cities! We all start the new year with a prayer for all the birds and animals that are suffering due to the greed of the human race and hope that more and more people use less and less of the earth’s resources to fulfill their needs and make time to be with nature! Postal address: Puvidham, Nagarkoodal village and post ( via) Indur, Dharmapuri , Pin no: 636803. Tamilnadu. India. புவிதம், இது அந்த பள்ளியின் பெயர். ஏன் புவிதம்…? அதை பின்பு காண்போம். நான் ஏன் அதை காட்டுப் பள்ளி என்கிறேன்…? நிச்சயம் அது காடுகள் சூழ இருப்பதால் மட்டும் அல்ல. காடுகளில் எப்படி மரங்கள் அதன் இயல்பில் வளருமோ, அது போல்தான் இங்கும் குழந்தைகள் அதன் இயல்பில் வளர்கிறார்கள். குழந்தைகள் மீது எந்த ரசாயனங்களும் தெளிக்கப்படுவதில்லை (ரசாயனங்கள் என்று நான் குறிப்பிடுவது, நம் விருப்பங்கள், பணம் சார்ந்து நமக்குள் இருக்கும் மதிப்பீடுகள், சக மனிதனை போட்டியாளராக கருத வைக்கும் நம் கருத்துகள்). 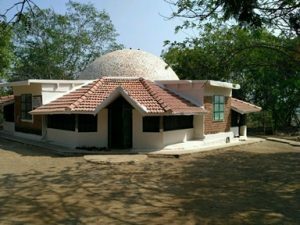 இவை எதுவும் அங்கு மாணவர்கள் மீது திணிக்கப்படுவதில்லை. அதனால்தான் அதை காட்டு பள்ளி என்கிறேன்.